Auberge Rozendal in Stellenbosch is a working wine farm offering fresh organic produce, award winning vinegar and idyllic country accommodation. For a room with a view, this wine farm in Stellenbosch has a top location and boasts fabulous organic food and wine to enjoy whilst relaxing in comfort. This fine country setting is just the place to rest well and savour the simple things in life only 40 minutes from Cape Town. Augberge Rozendal Wine Farm in Stellenbosch stands on a hill looking out at the surrounding mountains. The Manor House is 150 years old and houses the restaurant which is open daily for most of the year. Meals are served on the vine covered terrace and in the dining room which is decorated with original artworks, and where a roaring fire is lit on cooler days. All the set menus are prepared with fresh, home-grown foods and organic produce where possible. A tranquil and child friendly place, Auberge Rozendal is also wonderful for a romantic retreat. 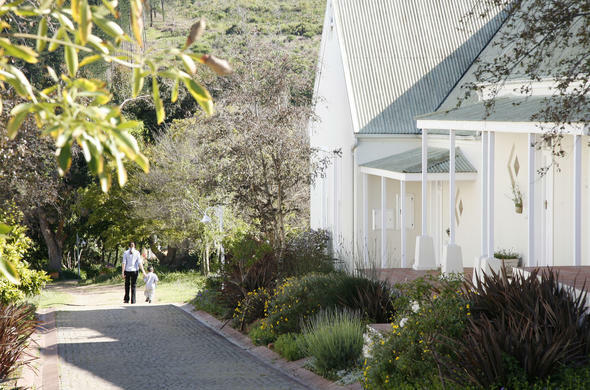 There are delightful wineland walks and biking trails amongst the vines and in the adjacent forest or guests can contemplate the beautiful surroundings from a lounger beside the swimming pool. Stellenbosch has a full range of activities for the whole family and is one of the oldest wine regions in the Cape Winelands.